Walleyes Inc. - Home - Action Packed Adventures In Walleye Fishing Online! Finally, a product that keeps live wells full of fresh, clean, oxygenated water when on the move! The SurvivorTM protrudes just below the bottom of the boat. When the boat is moving, the water rushing by is now deflected into SurvivorTM, through the livewell pump and then into the livewell. SurvivorTM provides fresh, clean, oxygenated water all of the time and fits all Livewell pumps! 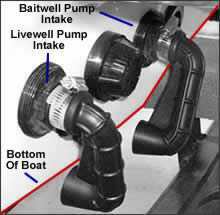 Saves wear & tear on your livewell/baitwell pumps! Works great at variable speeds! No extra hoses or fittings! Install In Seconds!! Survivor is made from a synthetic rubber material. The Survivor live well water intake system requires, no drilling, no voltage, no hoses, or additional hardware. 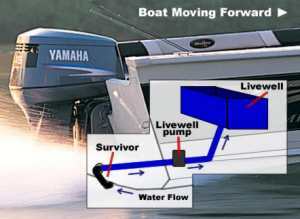 The Survivor live well water intake installs directly to the live well pump already installed on your boat. the Survivor live well water intake fits most all standard o e m applications. Keeps live wells full of fresh, clean, oxygenated water when on the move! 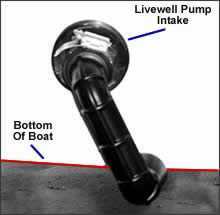 When the boat is sitting still, the live well pump acts normally by pumping fresh oxygenated water into your live well. As the boat begins to build up speed, a cavitation effect becomes apparent and the live well pump is now for the most part pulling in only air. This is where SurvivorTM comes in. SurvivorTM protrudes just below the bottom of the boat about an 1/8" or so. The water rushing by is now deflected into SurvivorTM, thru the live well pump and then into the live well. This keeps your live well full of fresh , clean, oxygenated water all of the time. This means no more lifeless fish. It also works great on bait wells. When on the move you can now turn the pump off because fresh new water is being force fed thru SurvivorTM. You can also regulate the flow of water into the live well by using the adjustable spray valve in your live well or bait well. It's just that simple. Product returns must be returned within 15 days of actual purchase date.